Ever since I started blogging, I've had the fortune of connecting with other bloggers, making some really good, genuine friends along the way. Kind, sincere and generous Meiko is one of them. She is a multi-talented, intelligent and blissfully happy full-time house wife. Writing blogs is only one of her many interests. One day Meiko asked if she could send me a book she thought I would like. 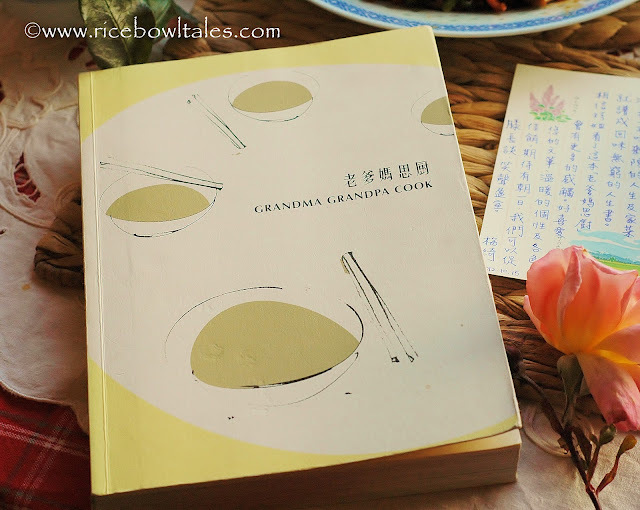 It's a collection of some 40 authentic stories told by grandmas and grandpas who came to Hong Kong from China as settlers before the Second World War. 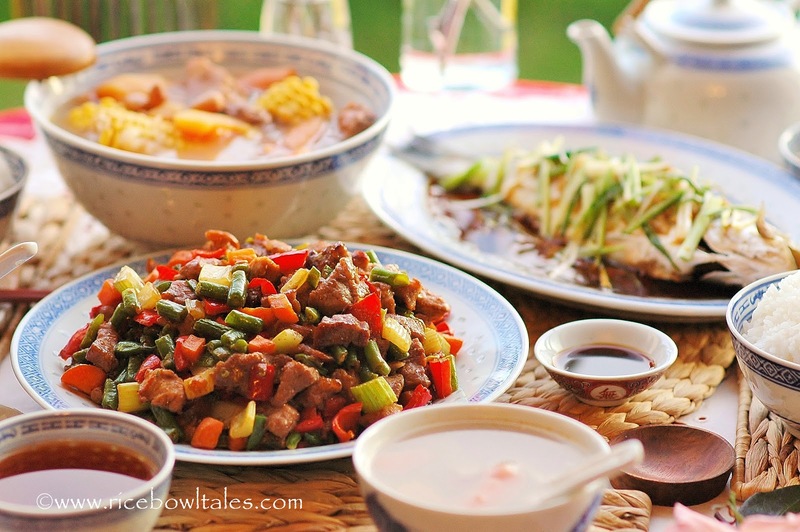 The tales are rich with their fond childhood memories as well as food that they grew up with. One lovely autumn morning, this wonderful gift arrived through the post! I felt deeply touched not only by the contents of the book, but also by the beautiful hand written note from Meiko that accompanied the parcel, and the nice heartfelt thoughts behind it. 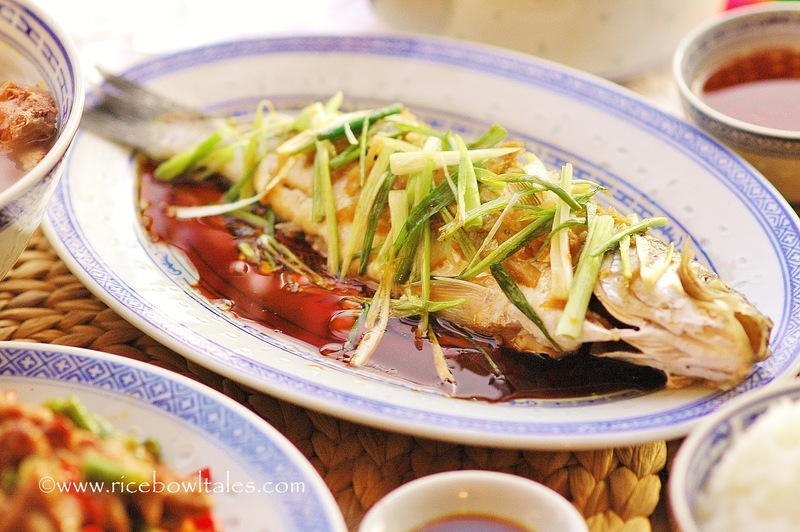 As I was reading the book, there were so many stories and dishes that I was familiar with. It reminded me of the things my dad used to tell us about, and the food that my mum used to cook for us. 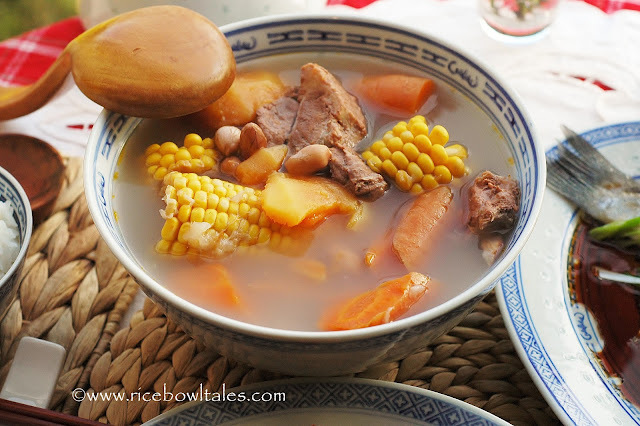 When I came upon the page about Papaya Soup and Stir-Fried Dice Pork with Green Beans and Vegetables, I knew I had to cook it myself in order to re-capture the taste and the recollection of my childhood days. Even my husband was feeling nostalgic about the old days as we were eating the dinner. Thank you Meiko, for your kind and sincere thoughts, and for sending this book. I will treasure it forever. Dice pork and put in the marinade for 10 minutes. Dice all the vegetables too and set aside. 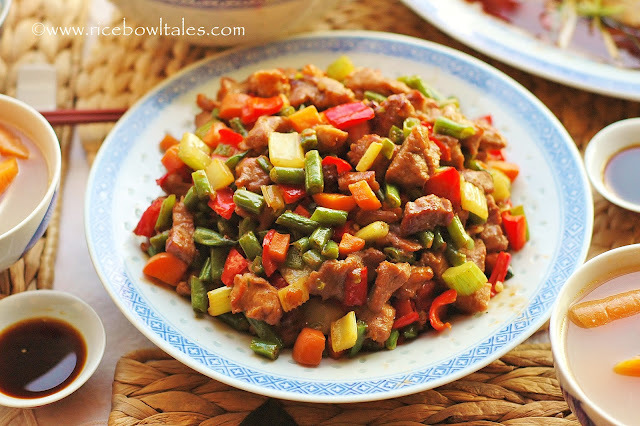 Heat pan and add a little oil, spread the pork out to a single layer and pan-fry both side till golden, then add the sweet red pepper and stir - fry to cook through, remove from heat. Use the same pan or a different one. Heat pan and add a little oil, put all the diced vegetables in, stir - fry for a little while, put in the crushed garlic, fry a few minutes then add 1 - 2 tbsp water, cooked through and add the pork, mix all together and serve. 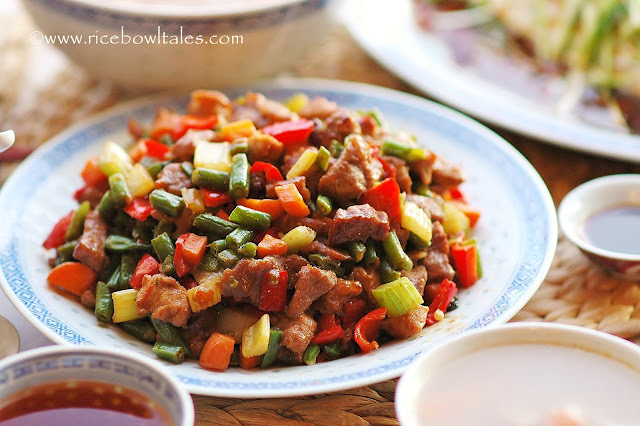 Although this is a simple stir - fried dish, it's full of flavours from my childhood memory. 對啊, 再同意不過! 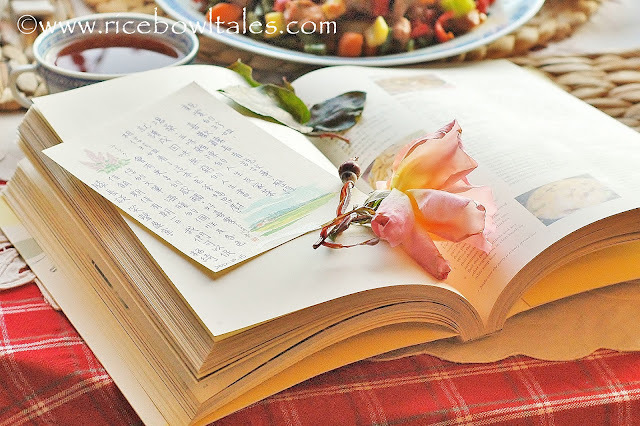 我也還是愛書。 不知為何, 有它們在的地方, 我都會流漣忘我!! Yes, Meiko was really kind and sweet indeed to have thought about sending this book to me; and knowing how much I would have appreciated it!! 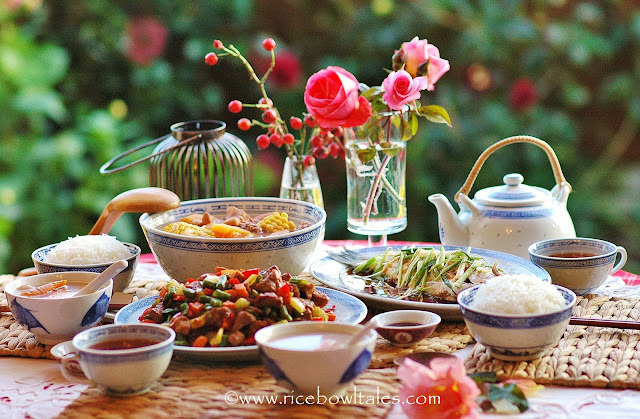 another homey and warm homecooked meal from you..I think i will like this book too, must try to find this book..i like cookbook with story.. I think you’ll enjoy reading this book, all the nostalgic dishes and touching stories told by the last generation. My Hubby now in shanghai and he already bought this book for me, I can't wait to read it, hehehe . Wow this book sounds like a great read. I must try to track it down. 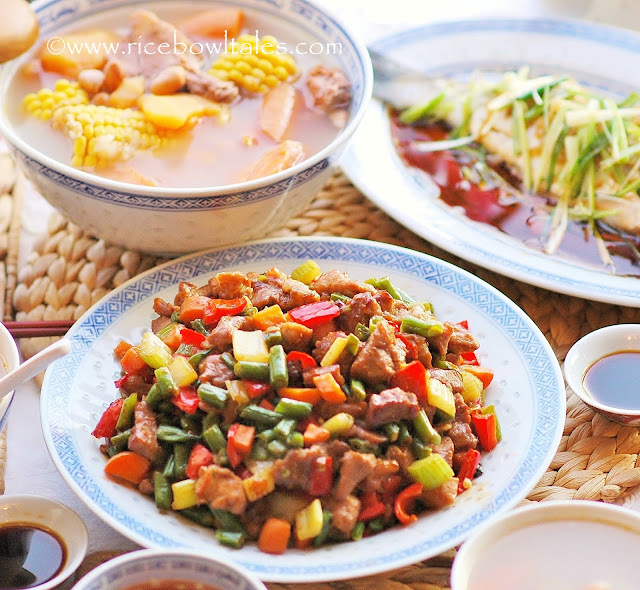 I love both dishes you cooked, I can imagine having extra rice with them!